OAKVILLE, ON, April 24, 2018 /CNW/ - Restaurant Brands International Inc. (TSX/NYSE: QSR, TSX: QSP) today reported financial results for the first quarter ended March 31, 2018. 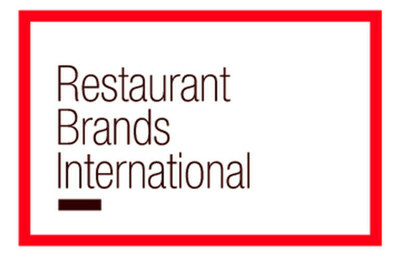 Daniel Schwartz, Chief Executive Officer of Restaurant Brands International Inc. ("RBI") commented, "During the first quarter, we continued to grow system-wide sales for each of our three iconic brands, and we have developed strong plans with our partners to further accelerate growth for the long term. At TIM HORTONS®, though results were soft, we have high conviction that our 'Winning Together' plan unveiled today will improve guest experience and drive sales and profitability for our restaurant owners. For BURGER KING®, we built upon our recent sales momentum and further accelerated our net restaurant growth. At POPEYES®, we improved comparable sales in the US, and announced our first international development agreement for the brand in Brazil. We continue to see a lot of growth potential for each of our three brands, and through our focus on enhancing guest satisfaction and franchisee profitability, we believe that we will create value for all of our stakeholders for many years to come." Note: System-wide sales growth and comparable sales are calculated on a constant currency basis and include sales at franchise restaurants and company-owned restaurants. System-wide sales are driven by sales at franchised restaurants, as approximately 100% of current restaurants are franchised. We do not record franchise sales as revenues; however, our franchise revenues include royalties based on a percentage of franchise sales. For 2017, PLK figures are shown for informational purposes only. The most significant changes of this adoption that affect comparability of our results of operations between 2018 and 2017 include a change in the timing of franchise fee revenue recognition and the reflection of advertising fund contributions and expenses. Under Previous Standards, we recognized franchise fees when we performed all material obligations and services, which generally occurred when franchised restaurants opened. Under the New Standard, we defer initial and renewal franchise fees and recognize this revenue over the term of the related franchise agreement. Under Previous Standards, we did not reflect advertising fund contributions or advertising fund expenditures in our Consolidated Statement of Operations, and temporary net differences between contributions and expenses were reflected as prepaid assets or accrued liabilities on our consolidated balance sheet. Under the New Standard, advertising fund contributions and expenditures for funds that we manage are reported on a gross basis in our Consolidated Statement of Operations. Additionally, for the first quarter, year-over-year results were impacted by the inclusion of Popeyes in our 2018 results. For year-over-year comparability purposes, we have included a reconciliation of 2018 results under Previous Standards and are calculating organic growth under Previous Standards for both periods presented. Additional details can be found in our Form 10-Q. Under Previous Standards, Total Revenues for the first quarter grew primarily as a result of the inclusion of our PLK segment and system-wide sales growth at BK, as well as a favorable FX impact, partially offset by a decrease in supply chain related revenues at TH. Net Income Attributable to Common Shareholders for the quarter, under both Previous Standards and the New Standard, was driven by the inclusion of our PLK segment, growth in BK segment income, and the redemption of our preferred shares in 2017. Under Previous Standards, Adjusted EBITDA for the quarter grew 5.0% on an organic basis versus prior year combined results (including Popeyes), driven primarily by an increase in revenues at BK and PLK, partially offset by a decrease in supply chain related revenues at TH. TH Adjusted EBITDA includes $3.1 million and $2.8 million of cash distributions received from equity method investments for the three months ended March 31, 2018 and 2017, respectively. For the first quarter of 2018, system-wide sales growth was primarily driven by net restaurant growth of 2.8%. Comparable sales of (0.3)% was primarily driven by relatively flat Canada comparable sales. Under Previous Standards, Total Revenues for the quarter declined (3.0)% ((6.8)% excluding the impact of FX movements) versus prior year, primarily reflecting a decrease in supply chain related revenues, partially offset by a favorable impact of FX movements. Under Previous Standards, Adjusted EBITDA for the quarter declined (2.2)% ((6.1)% excluding the impact of FX movements) versus prior year, primarily as a result of a decrease in Total Revenues, partially offset by a favorable impact of FX movements. BK Adjusted EBITDA includes $1.2 million of cash distributions received from equity method investments for the three months ended March 31, 2018. For the first quarter of 2018, system-wide sales growth was driven by net restaurant growth of 6.9% and comparable sales of 3.8%, which was primarily driven by US comparable sales of 4.2%. Under Previous Standards, Total Revenues for the quarter grew 9.7% (6.6% excluding the impact of FX movements) versus prior year, reflecting growth in system-wide sales. Under Previous Standards, Adjusted EBITDA for the quarter grew 14.9% (11.5% excluding the impact of FX movements) versus prior year, primarily as a result of an increase in Total Revenues. For the first quarter of 2018, system-wide sales growth was driven by net restaurant growth of 6.7% and comparable sales of 3.2%, which was primarily driven by US comparable sales of 2.3%. PLK revenues and segment income from the acquisition date of March 27, 2017 through March 31, 2017 were not material to our consolidated financial statements, and therefore were not included in our consolidated statement of operations for the three months ended March 31, 2017. As of March 31, 2018, total debt was $12.3 billion, and net debt (total debt less cash and cash equivalents of $0.9 billion) was $11.4 billion. Effective January 1, 2018, we adopted new guidance related to hedge accounting, which amends hedge accounting recognition and presentation requirements. Most notably, under the new guidance for our net investment hedges, all components not related to spot remeasurements on the notional amount of these instruments are included in interest expense, net, whereas previously they were recorded in other comprehensive income. Additional details about this accounting standard can be found in our Form 10-Q. On April 24, 2018, the RBI Board of Directors declared a dividend of $0.45 per common share and partnership exchangeable unit of Restaurant Brands International Limited Partnership for the second quarter of 2018. The dividend will be payable on July 3, 2018 to shareholders and unitholders of record at the close of business on May 15, 2018. We will host an investor conference call and webcast at 8:30 a.m. Eastern Time on Tuesday, April 24, 2018, to review financial results for the first quarter ended March 31, 2018. The earnings call will be broadcast live via our investor relations website at http://investor.rbi.com and a replay will be available for 30 days following the release. The dial-in number is (877) 317-6711 for U.S. callers, (866) 450-4696 for Canadian callers, and (412) 317-5475 for callers from other countries. This press release contains certain forward-looking statements and information, which reflect management's current beliefs and expectations regarding future events and operating performance and speak only as of the date hereof. These forward-looking statements are not guarantees of future performance and involve a number of risks and uncertainties. These forward-looking statements include statements about our expectations regarding our high conviction that our "Winning Together" plan unveiled this morning will improve guest experience and drive sales and profitability for our Tim Hortons restaurant owners; our expectations regarding the growth potential for each of our three brands; and our expectations and belief that through our focus on enhancing guest satisfaction and franchisee profitability, we will create value for all of our stakeholders for many years to come. The factors that could cause actual results to differ materially from RBI's expectations are detailed in filings of RBI with the Securities and Exchange Commission and applicable Canadian securities regulatory authorities, such as its annual and quarterly reports and current reports on Form 8-K, and include the following: risks related to RBI's ability to successfully implement its domestic and international growth strategy; and risks related to RBI's ability to compete domestically and internationally in an intensely competitive industry. Other than as required under U.S. federal securities laws or Canadian securities laws, we do not assume a duty to update these forward-looking statements, whether as a result of new information, subsequent events or circumstances, change in expectations or otherwise. For 2017, PLK comparable sales, system-wide sales growth and system-wide sales are for the period from December 26, 2016 through March 27, 2017. Comparable sales and system-wide sales growth are calculated using the same period in the prior year (December 26, 2015 through March 27, 2016). For 2018, PLK net restaurant growth is for the period from March 27, 2017 through March 31, 2018. PLK restaurant count is as of March 31, 2018 for the current period, and as of March 27, 2017 for the comparative period, inclusive of temporary closures. For 2017, PLK figures are shown for informational purposes only and are consistent with PLK's former fiscal calendar. Consequently, PLK results for 2018 may not be comparable to those of 2017. Segment SG&A includes segment selling expenses, including advertising fund expenses, and segment general and administrative expenses and excludes share-based compensation and non-cash incentive compensation expense, depreciation and amortization, PLK transaction costs, and corporate restructuring and tax advisory fees. Litigation settlements (gains) and reserves, net in the current period primarily reflects proceeds received from the successful resolution of a legacy BK litigation. To supplement our condensed consolidated financial statements presented on a GAAP basis, RBI reports the following non-GAAP financial measures: EBITDA, Adjusted EBITDA, Adjusted Net Income, Adjusted Diluted Earnings per Share ("Adjusted Diluted EPS"), Combined Total Revenues, Combined Adjusted EBITDA, Organic revenue growth and Organic Adjusted EBITDA growth. We believe that these non-GAAP measures are useful to investors in assessing our operating performance, as it provides them with the same tools that management uses to evaluate our performance and is responsive to questions we receive from both investors and analysts. By disclosing these non-GAAP measures, we intend to provide investors with a consistent comparison of our operating results and trends for the periods presented. Adjusted EBITDA is defined as EBITDA excluding the non-cash impact of share-based compensation and non-cash incentive compensation expense and (income) loss from equity method investments, net of cash distributions received from equity method investments, as well as other operating expenses (income), net. Other specifically identified costs associated with non-recurring projects are also excluded from Adjusted EBITDA, including PLK transaction costs associated with the acquisition of Popeyes and corporate restructuring and tax advisory fees. Adjusted EBITDA is used by management to measure operating performance of the business, excluding these non-cash and other specifically identified items that management believes are not relevant to management's assessment of operating performance or the performance of an acquired business. Adjusted EBITDA, as defined above, also represents our measure of segment income for each of our three operating segments. PLK revenues and segment income from the acquisition date of March 27, 2017 through March 31, 2017 were not material to our consolidated financial statements, and therefore were not included in our consolidated statement of operations for the three months ended March 31, 2017. (a) RBI acquired Popeyes Louisiana Kitchen, Inc. ("Popeyes") on March 27, 2017. Prior to its acquisition by RBI, Popeyes operated on a fiscal period basis consisting of a 16-week first fiscal quarter and 12-week second through fourth fiscal quarters. Subsequent to its acquisition by RBI, Popeyes commenced reporting on a calendar quarter basis consistent with RBI. Q1'18 for PLK represents the period from January 1, 2018 through March 31, 2018, while Q1'17 for PLK represents the period from December 26, 2016 through March 27, 2017. Consequently, PLK results for the prior year period may not be comparable. In connection with the acquisition of Popeyes Louisiana Kitchen, Inc., we incurred certain non-recurring selling, general and administrative expenses during the three months ended March 31, 2018, respectively, primarily consisting of professional fees and compensation related expenses. Costs associated with corporate restructuring initiatives and professional advisory and consulting services related to the interpretation of the Tax Cuts and Jobs Act, which was enacted on December 22, 2017. As a result of the accounting standard related to the tax impact of equity based compensation, our effective tax rate was reduced by 22.7% and 3.9% for the three months ended March 31, 2018 and 2017, respectively, and our adjusted effective tax rate was reduced by 20.3% and 2.7% for the three months ended March 31, 2018 and 2017, respectively.